JagMIND: Bomb Squad was created as a rection to wishes of the community. It takes the basic idea of a mastermind game to a whole new level. This time you don't have to arrange colored symbols to guess a code. No. 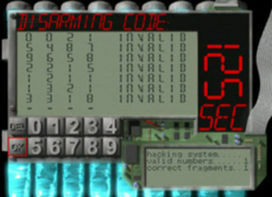 You have to guess the disarming code of a bomb, that will explode unless you crack the code in time. Next to a high score hunting single player mode the game also features a very fun two player competition "death-match" mode, which is often overlooked. This game was the first fully polished and encrypted game release for the Atari Jaguar CD by Lars Hannig. It also supported the Memory Track. It's the only game that can be played entirely using the Jaguar keypad. 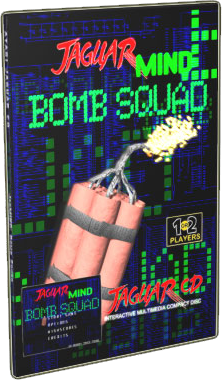 JagMIND: Bomb Squad is an often overlooked and underrated game that is considered a gem for fans of fast paced logic games. The limited edition came with keypad overlays.